Car won’t start? Check engine light on? Running rough? The cause could be as simple as a loose battery terminal or the gas cap not sealing, or as complicated as ignition, fuel or internal engine problems. Proper vehicle diagnostics is a tricky business. It requires experienced technicians with a thorough understanding of the vehicle’s intricate systems and components, their relation to one and another and the use of state of the art equipment. If you’re having car problems, we’re here to help. We have the knowledge, skills, experience, tools and integrity you can count on to provide an honest assessment of your car care needs and make the necessary repair(s) to get your car running smoothly. We give you the information and options you need to make informed decisions about your automotive service and repair needs. 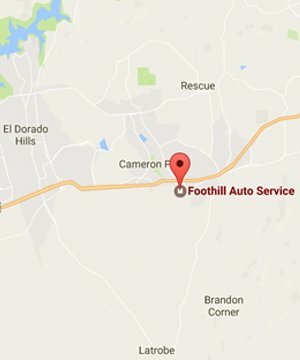 Foothill Auto Service has been providing quality auto repair and maintenance services to residents of Cameron Park, CA and surrounding areas since 1998. If you are having problems with your car, don’t hesitate to contact us. We will perform the necessary automotive diagnostics to determine the cause of the problem(s) and recommend the best possible, cost-effective solution. Stop by or give us a call if you have any questions or need more information about our services.